Toyota and Italy's Zagato design house are back together for another round of dress-up. Devotees of mid-engined Toyotas (guilty) may recall the 2001 Toyota Zagato VM 180, a limited-edition model of the MR2 Spyder (MRS) available in Japan (see photo below). 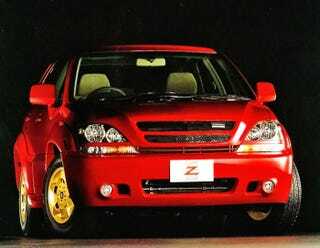 Now the Toyos are offering a Zagato-fied special edition of the J-spec Toyota Harrier (Lexus RX) SUV. Only 250 examples of the Harrier Zagato — marking the 50th anniversary of Toyopet dealership network — will be available in Japan, as part of its Modellista aftermarket custom program. Think Lexus-meets-Group B.